Are planning to throw a party at your place? If this is so then, making the use of brilliant looking organza ribbons is a perfect thing for you. Organza is a kind of fabric that can be created with a variety of materials like silk, synthetic of the blend of these two. Organza ribbon holds a lightweight, shiny and stiff texture. The vertical & horizontal threads of the organza ribbon are weaved in a way that completely resembles the style of a checkerboard. This modern technique of its creation provides the ribbon with perfect quality strength and for this reason organza ribbons are the most preferred ones to be utilized for a variety of projects. 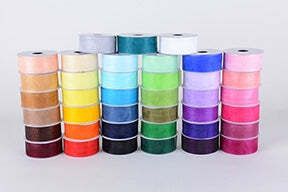 At BBCrafts, you can easily come across some of the excellent ribbons for you to choose from. So, if you are planning throw a birthday party or some other celebration at your place then our organza ribbons can wonders to make your party more thrilling! !